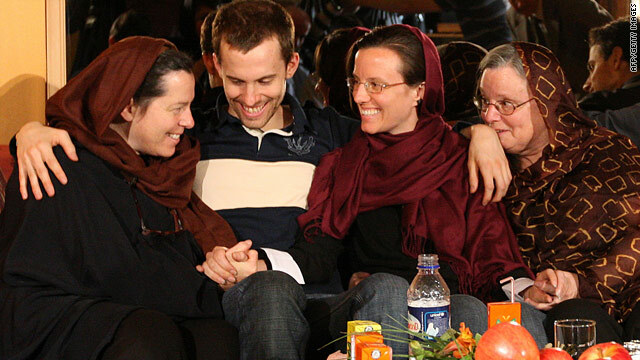 Detained U.S. hikers Shane Bauer and Sarah Shourd, second from right, are reunited with their mothers in Tehran, Iran. Tehran, Iran (CNN) -- The mothers of three American hikers detained in Iran met with their children Thursday, Iran's Press TV reported, airing pictures of the tearful reunion. Sarah Shourd, 31; Shane Bauer, 27; and Josh Fattal, 27, were detained in July. Their families have said the three accidentally strayed across an unmarked border into Iran while on a hiking trip in Iraq's Kurdistan. "I was happy to see the video of the reunion," said the hikers' attorney, Masoud Shafii. "I didn't expect them to show it on TV, but they did." The hikers' mothers have requested a meeting with Iranian President Mahmoud Ahmadinejad and Supreme Leader Ayatollah Ali Khamenei, Shafii said. "They came with the hope of seeing them and asking for their children's freedom," he said. "I'm not sure if the meeting is going to happen, but that's what they want." Fattal's mother, Laura Fattal, last week picked up visas that enabled her and the two other mothers to enter Iran to visit their children. They had applied for visas six months ago. Shafii said a Swiss ambassador had told him the mothers met with their children Thursday afternoon at Hotel Esteghlal (Independence), an upscale hotel in northern Tehran. That would mean the hikers were taken out of Tehran's Evin prison for the meeting. The three Americans have not been formally charged, although Iran has said they will face trial on espionage charges. The trio has had little contact with the outside world since their arrests. They made a brief phone call home March 9 and have had access to a few letters and messages sent by relatives, friends and supporters. The Swiss ambassador met with the detainees last month and said Bauer and Shourd were in poor health and were considering a hunger strike. The Swiss have been representing American interests in the case in the absence of formal U.S.-Iran diplomatic relations.